Donald Trump is embarking on a frenzied dash across America in the last four days of campaigning before Tuesday’s midterm elections, staging nine rallies in eight states in a last-ditch effort help the Republicans keep control of Congress. His hectic schedule takes Trump through the heartlands of his conservative base. It begins on Friday in coal country in West Virginia and Indiana; takes him to Montana and Florida on Saturday; hits Georgia and Tennessee on Sunday and ends with a three-stop marathon on Monday in Ohio, Indiana for a second time, and Missouri. The electoral map of his final rallies is as telling for where he is going as where he is not going. He is focusing heavily on rural areas where his red-hatted Make America Great Again followers are concentrated, while avoiding suburban districts that are home to wealthier conservatives less keen on him. Trump’s rallies have become a crucial element of his electoral toolkit. They allow him to communicate viscerally with his most passionate supporters in the hope they will spearhead turnout. Increasingly, his message has focused on anti-immigration and a nationalist call to put “America first”. At a rally in Columbia, Missouri, on Thursday night he spoke in lurid terms about violent caravans of asylum-seekers headed for the US border, fueled by Democratic money. The beeline that Trump is making for his base has implications for the kinds of races he is trying to sway. It pushes him towards statewide battles over US Senate seats and governorships, and away from suburban districts that will decide which party controls the House of Representatives. “Trump has made a clear choice to deliver his closing argument in very conservative areas, which you could see as a strategic decision to concede the House,” said Democratic strategist Simon Rosenberg. By contrast, Trump is hitting hard several states where Republicans hope to take US Senate seats off the Democrats and thereby secure or even strengthen their control of the upper chamber (they currently hold 51 seats to the Democrats’ 49). They are helped here by the luck of the draw – in this election, with a third of Senate seats up for grabs, the Democrats have the misfortune of having to defend 26 seats against the Republicans’ nine. Among the Senate races that Trump is hoping to influence with his inflammatory rhetoric on immigration is Missouri, where the president will hold his final rally at 9pm on Monday. The Democratic incumbent, Claire McCaskill, is locked in a fierce battle there with the state’s Republican attorney general, Josh Hawley. Trump also hopes to kick out Democratic incumbents in West Virginia (Joe Manchin) and Indiana (Joe Donnelly). In Montana, he is going to exceptional lengths to destroy Democrat Jon Tester – when Air Force One lands in Belgrade, Montana on Saturday it will be Trump’s fourth appearance in the state in the midterms. But then it’s personal in this case: Trump was angered by Tester’s oppositionto his nominee for secretary of veterans affairs, Ronny Jackson, and is seeking his revenge. Several high-profile gubernatorial races are also firmly on Trump’s radar in the dying stages of the campaign. They include Georgia, where he is trying to stop Democrat Stacey Abrams from becoming the first black woman governor in the country; and Florida, where another prominent black candidate, Andrew Gillum, has taken a slight lead in recent polls over rival Ron DeSantis. The nailbiting finish in Florida underlines the vital importance of these midterm elections for both main political parties, and for Trump. If Gillum wins he would be in a position to promote his firm belief that the president should be impeached for “high crimes and misdemeanors”. Should the Democrats take back the House of Representatives on Tuesday, they could investigate Trump aggressively through powerful congressional committees with subpoena powers. They could also vote to impeach the president should Robert Mueller, the special counsel in the Russia investigation, uncover serious wrongdoing on the president’s part. However, to convict Trump of any charges presented by the House, the Democrats would also need to gain control on Tuesday of the US Senate. That’s a much taller order that Trump is doing everything in his power to prevent as he scurries round the country carrying his message of a booming economy, tax cuts and immigration clampdowns. That is ONE of the reasons that Trump is giving up on the congress…. 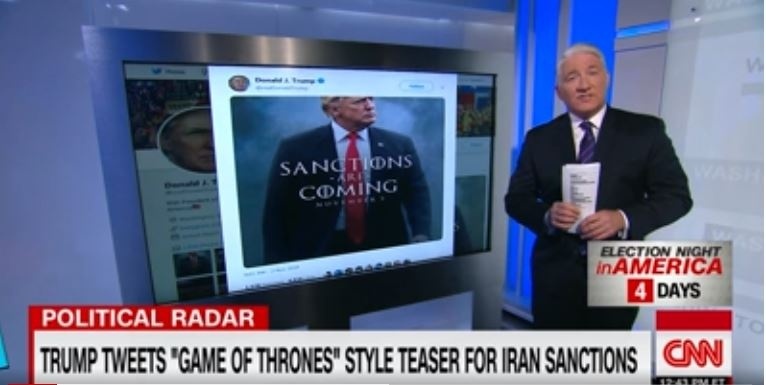 Trump on Friday tweeted a meme with the words, “Sanctions are coming – November 5”, written in text reminiscent of the “Game of Thrones” title font.